:: Will Young has a new song. :: Will Young's new song is called Jealousy. :: The key lyric is "And it feee-eels like jealousy". :: It is important to note that the feeling in question is not, therefore, actual jealousy. :: Things that feel like jealousy include envy, longing and fish burps. :: Jealousy is produced by Richard X, "famed" for writing that one good Rachel Stevens song in 2004.
:: The chorus verges on the anthemic. It also verges on Joe McElderry's version of Ambitions. :: Stalker lyrics alert: "Watching you walk / I followed you there / Standing too close / It's hurting." :: Maybe you shouldn't stand so close then, you dolt. :: Jealousy will be released on 21st August, the 10th anniversary of Will's first Pop Idol audition. :: But it premiered this morning on Ridings FM - bringing the best music mix to Wakefield, Castleford, Pontefract, Featherstone, Knottingley and Normanton! * I wrote this headline before discovering this video. 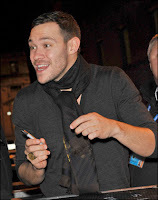 Will Young need never be jealous of anyone's pen, because his pen is the best.